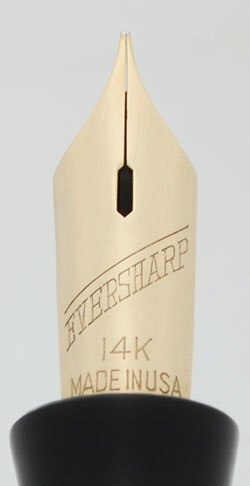 Eversharp Skyline fountain pen and mechanical pencil with jet black bodies and 1/10 14k gold filled caps. They both have uncommon wide plain cap bands and gold derbies. 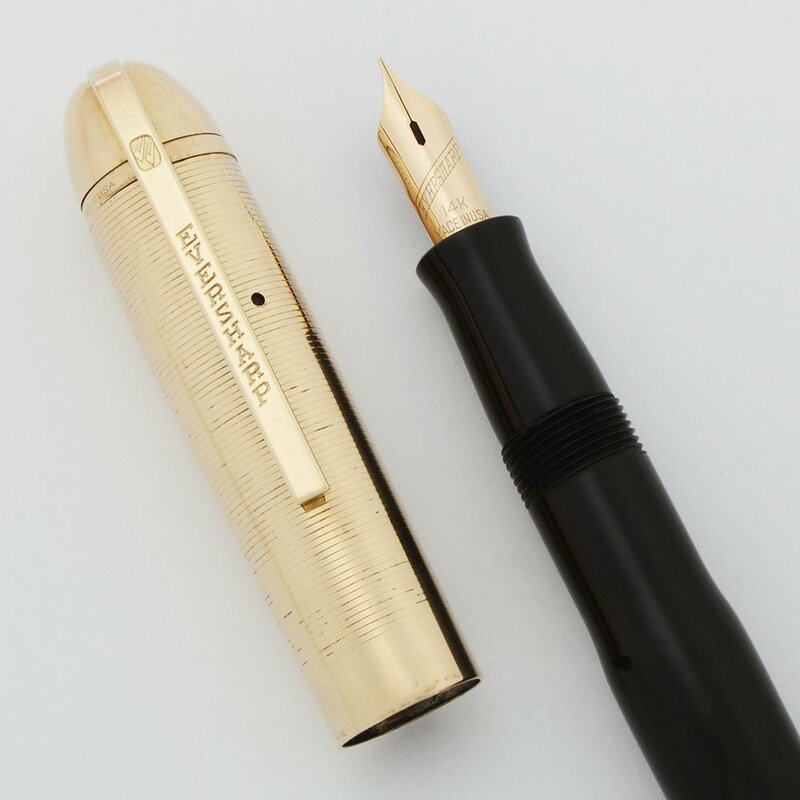 The fountain pen has a 14k fine nib and the mechanical pencil takes "thick" or 1.1mm leads. 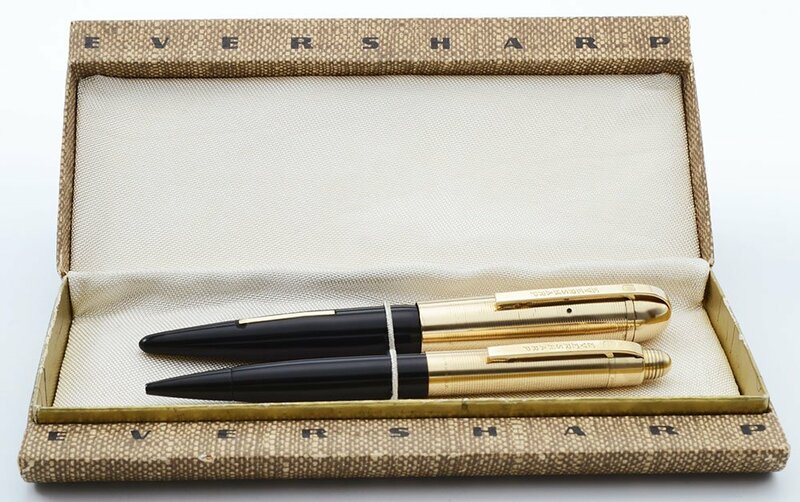 They ship in an Eversharp box together and are in excellent + restored condition. Length The fountain pen measures 4-7/8" and the pencil measures 4-5/8". These are the demi size. 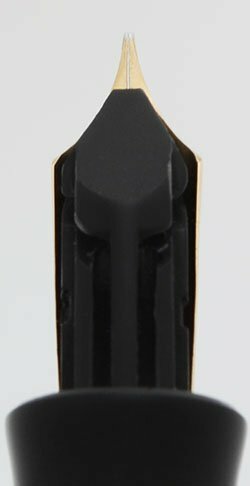 Color Jet Black barrels and sections with 1/10 14k gold filled caps with horizontal lines. The cap derby is gold filled and it has a 3/16" wide plain cap band. Nib FINE manifold 14k nib. Condition Excellent + condition with very lttle signs of usage. This is a very pretty, shiny set sitting in its original Eversharp cardboard box with a brown tweed pattern and silky interior. The fountain pen barrel has a few light marks caused by the cap but otherwise is in near mint condition. The mechanical pencil barel is pristine with just some very light scratch marks, however the cap on the pencil has an area of discoloration (visible to the naked eye) to the left of the clip, but it is otherwise looking shiny and nice. The imprints are clear.